It's interesting how life gives you unexpected surprises. I remember visiting Mount Rushmore for the first time when I was about twelve years old. Never did I imagine that I'd be writing books about it! It all started back in 2004. A woman from the Mount Rushmore Society (who ended up being my editor) asked me if I knew of anyone who might be interested in writing a children's book about the memorial. So far, I've written four books about Mount Rushmore. Who Carved the Mountain? The Story of Mount Rushmore is a picture book with beautiful illustrations by Renee Graef. 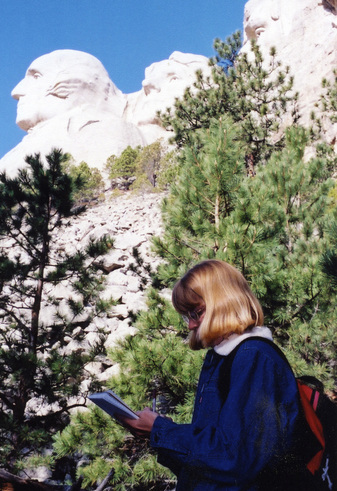 Face to Face with Mount Rushmore is a book for older kids and includes tons of questions to help readers think about Mount Rushmore from several perspectives. I also love to answer questions about Mount Rushmore, so if there's something you'd like to know that hasn't been covered, please shoot me an email.